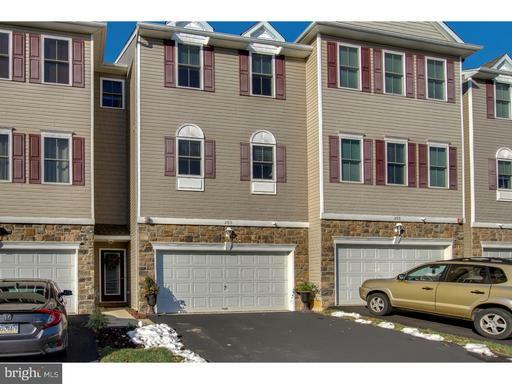 MOVE IN READY 4-year old townhouse located in popular Saddlebrook Estates development! Easy access to major routes, shopping, and entertainment. 9-foot ceilings, hardwood flooring, neutral carpet and paint, and recessed lighting throughout! Gourmet kitchen package includes upgraded stainless steel appliances, enormous island with sink, french door refrigerator, extra cabinet space, and a mounted microwave. Undermount stainless steel sink with granite countertop and 2 large pantries complete the kitchen. Sliding door off the living room leads to the composite deck with privacy fence and is perfect for grilling and entertaining throughout the year! Upstairs includes three well apportioned bedrooms, ceiling fans, and convenient laundry access. Master bedroom includes large walk-in closet, designer blinds, and master bathroom with stall shower, tiled floor, and vanity. 2nd and 3rd bedrooms both have double door closets with plenty of space. Finished lower level is perfect for use as a family, movie, or game room and has a stone veneer accent wall with an electric fireplace insert perfect for the colder nights. Double car garage with opener leave plenty of room for extra storage. Washer, dryer, refrigerator, and all window treatments are included! Act quickly, or this one will be gone!